My name is Bianca Kunnuji, co-founder of The City Eats, nonprofit organization. As some of you may know, last year with all of your help I was awarded IVHQ Volunteer of the Year for 2017. Upon winning, I was awarded an opportunity to travel almost anywhere I want and volunteer there for two weeks. After a lot of back and forth because there are so many amazing options, I decided that I would be taking my first volunteer abroad trip to Cape Town, South Africa. I was so excited to go to Cape Town because not only is it somewhere I’ve always wanted to go, but I’m able to do something that truly makes me happy, and that is be of service. I’m not sure if many of you know, but Cape Town, a city of 4 million, is less than 2 months away from becoming the World’s first major city to run out of water. South Africa is currently experiencing the worst drought in history lasting three years. In a small, but meaningful attempt, from now leading up until my trip I will be raising funds to get materials to take with me for my two-week trip on February 28th. I will be purchasing dry shampoo, packets of wipes, hand sanitizer, talc powder and donating the rest towards relief efforts or shipping water out there. I am asking you all to help me make as much of a difference as possible. In partnership with The City Eats, we will be raising funds to help the residents of Cape Town. If you work for any company that would like to help in any way, please feel free to reach out to me. 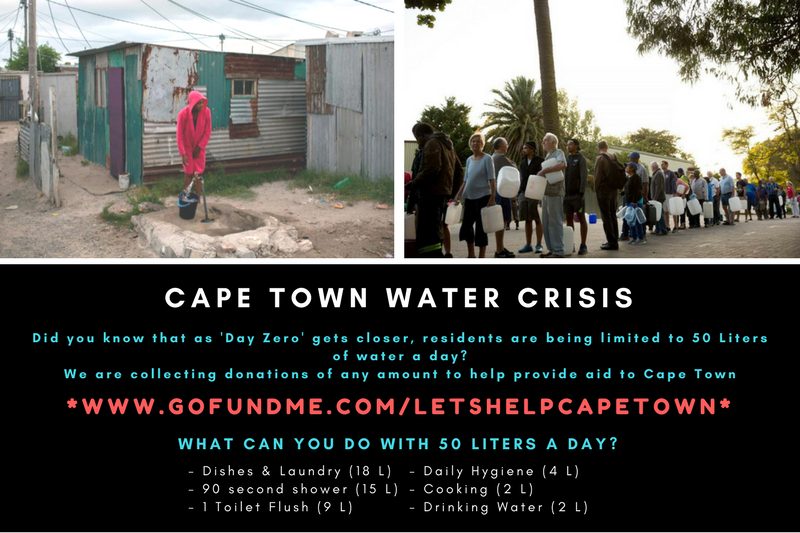 Simple things we take for granted like flushing our toilet, are things that the residents of Cape Town currently have to monitor, and that is just one of the many cuts they are currently making to make the most of their 50 liter a day allotment. In addition, residents will have to limit their showers to 90 seconds a day, refrain from washing dishes until they have to... etc. I am still so so excited to be blessed with this opportunity now more than ever. Cape Town may be the first but it definitely won’t be the last to be affected like this, so it’s also something to keep in mind when we waste water over here in California.